This part should fit your vehicle. It is a universal part. The Edelbrock Total Power Package concept of selling dyno-matched components has been popular since the 1980s, but with the introduction of the Performer RPM Power Package Top End Kits, Edelbrock matched parts are now available under one part number! Our Top End Kits have been a huge hit due to their all-in-one-box convenience and “no guesswork” performance appeal. With just about everything you need to top off your engine, these Top End Kits are performance-proven. 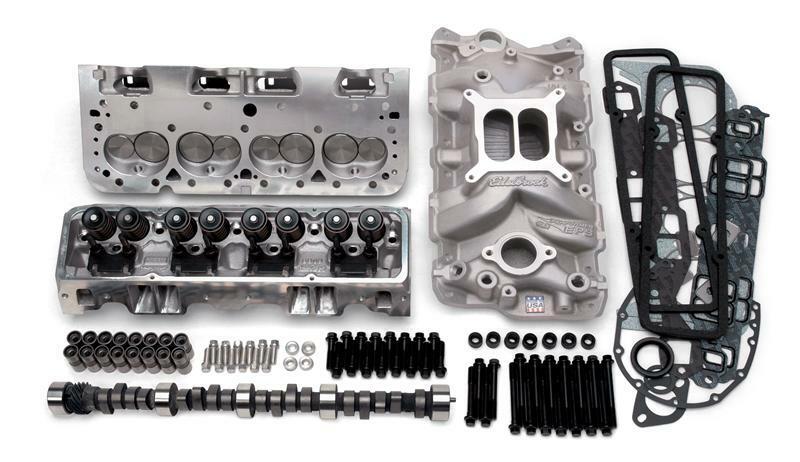 They include an Edelbrock intake, cylinder heads, hydraulic cam & lifters or hydraulic roller cam, timing chain (in most cases), complete bolt kits and an Edelbrock gasket set. For our Top End Kits, choose the best Edelbrock carburetor for your application and check out the horsepower listed with each kit. These are real results from engine dynamometer tests on factory short blocks. Edelbrock Top End Kits deliver seat-of-the-pants performance you can feel throughout the RPM range!